I’m working on a website which is written in traditional ASP.NET, uses AjaxControlToolKit and all kinds of historic goodies. If we where in 2008, I’d be buying the original developers a beer. However, what you can’t rely on is what gets changed after. The project uses RegisterClientScriptResource in quite a few places, been a while since I used this. Now I took this project on because of quite a big issue: Google made Maps v2 obsolete and it needed fixing. The code is a cluster of JS api’s intertwined into custom .NET Controls and 3rd party libraries. 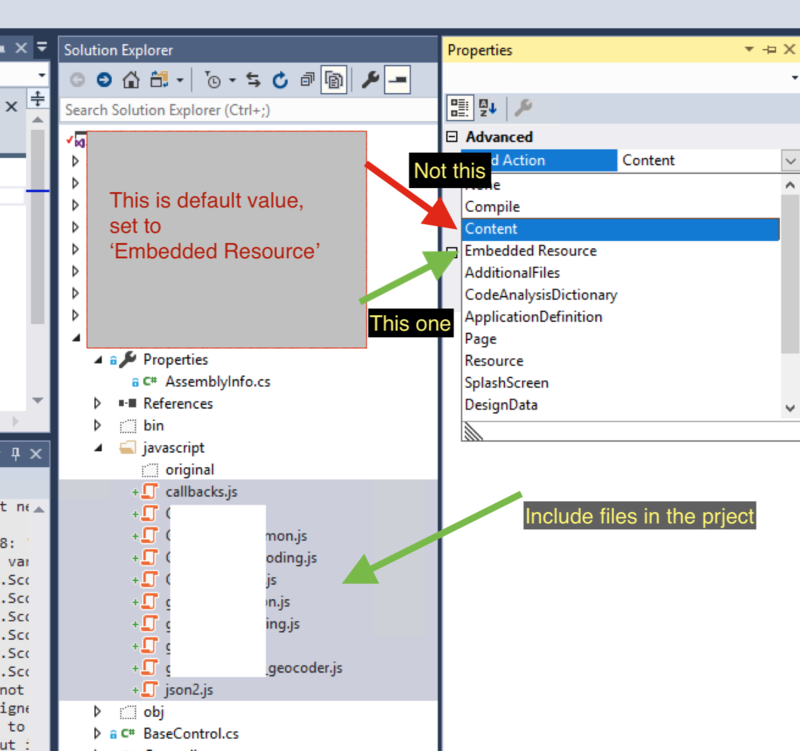 Now if you’ve used RegisterClientScriptResource before, you will know that you need to reference the JS file in the project and mark the content as “Embedded Resource”. Something I’d forgotten and spent quite a number of hours trying to remember. Because of the issue with Google, somebody else took a stab at it, for some reason they’d excluded the js files from the project, then added blank empty files of the same name and then excluded those too. Fun. Event message: An error occurred processing a web or script resource request. The requested resource '<filename>.js' does not exist or there was a problem loading it. If you’ve done this and you’re still getting these errors, then my friend, I wish you good luck. Nobody can help you.